What do you think you need to defend? In all the years I’d sung that song I’d scarcely paid any attention to the shield part. After all, it was a song about studying war no more, and war, as we all know, is about swords. But when she emphasized those words — “and shield” — I realized that laying down the shield is even more radical than laying down the sword, because to lay down one’s shield is to lay down one’s fear. 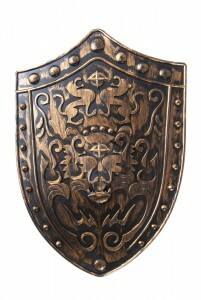 In truth, we rarely lay down our shield. We spend a lot of energy trying to defend ourselves against the threat of attack, whether it be of terrorists, lawsuits, or even personal embarrassment. If you start paying attention, you’ll probably notice how often you use the shield in everyday interactions. Every time you feel the impulse to defend your opinion, or your experience, or your worth you are holding forth the shield. A few lines from the Tao te Ching come to my mind about all of this. There is no greater illusion than fear. Why? Because fear arises out of a deep misconception we have about ourselves. When you dig down to discover the roots of our need to attack and defend, what you find is the ego, which perceives itself to be separate, alone, vulnerable, mortal, and consequently, is very afraid. But the ego isn’t the true Self; it’s more like an imaginary self. The true Self is everything the ego isn’t: one with the All, eternal, invulnerable, abiding in complete Love. In Ultimate Reality there is no fear, because in Ultimate Reality we are never harmed. Death doesn’t exist, and without it neither does fear. Swords and shields are meaningless. The sword and the shield are two sides of the same coin, and even if we have set aside the sword, until we lay down the shield as well we are still buying into the ego’s story about danger, fear, violence and mistrust. In other words, we are still dwelling in the ego’s illusory world rather than in Reality. i love your posts… growing, evolving, developing reflections…. about me! Noris, I’m so glad the reflections are connecting with you!